I’ve always thought that motor gliders are cool. Really long wings. Crazy glide ratios. And engines. Yeah, the purists probably have their issues with the motors, but not me. 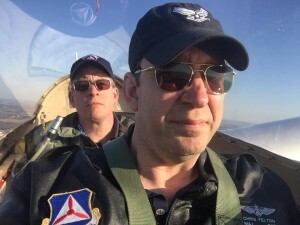 It a motor in the froint is the price for not having to have a tow plane, tow pilot, and at least one wing runner in order to go soaring, I’m good with it. Crazy-skilled glider and powered pilot Mark Grant flew the demo. 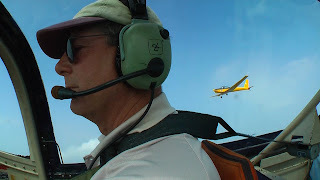 He has access to the two Schweizer SGM 2-37 motor gliders owned by the Tuskegee Airmen National Historical Museum and we went up as lead in a formation of two. 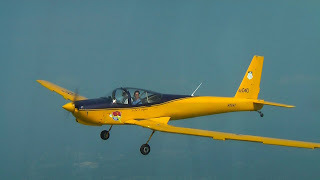 The Schweizer SGM 2-37 is a two-place, side-by-side, fixed gear, low wing, motorized glider. These two represent a sixth of the total production run between 1982 and 1988. None of them saw service with the Air Force Academy, which flew them under the designation TG-7A until 2003. It’s about 28 feet long, 57 feet wingtip to wingtip, and eight feet tall at the tail. The Lycoming O-235-L2C engine puts out 112 hp, plenty to get us up to 3,500 feet above the airport. 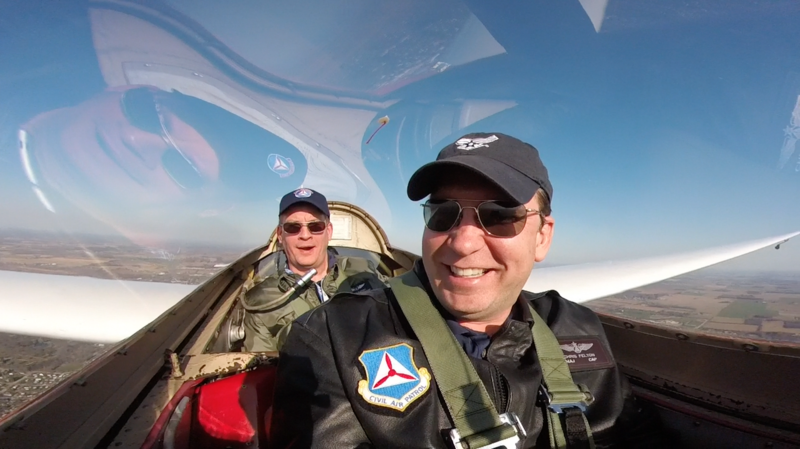 We launched as a flight of two and flew a loose right echelon for the first thousand feet or so. Maybe 200-300 feet of clearance between aircraft. You solo the SGM 2-37 from the right seat and that’s where Mark was most comfortable, so we flew the right echelon for his visibility and because we were going to make right turns in the climb. Here’s a show of the other aircraft in the formation. 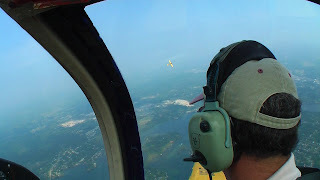 Above about 1,000 feet AGL, Mark accelerated his right turn so that we ended up climbing in a large circle, wingtip to wingtip. You can see the other ship pretty clearly in this shot just before we got to 3,500 MSL. 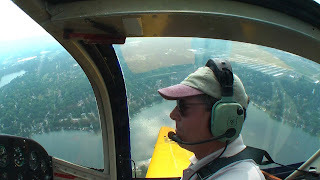 Here’s a good shot of Mark and the landscape just after we cut the engine and went into the glide phase of the flight. 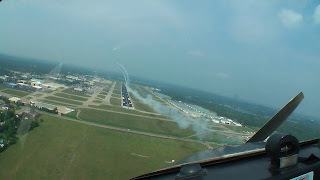 We stayed in a roughly circular rotation over the airport until we descended to pattern level (about 1,800 MSL) and then entered a left downwind for 27L. We lead and the other ship followed about a half mile behind. Here’s the view as we rolled onto final. A formation of five T-6’s did two or more sorties consisting of low passes with smoke on. We coordinated with the tower and glided in behind them. Kind of cool to see the smoke down the runway from this perspective. 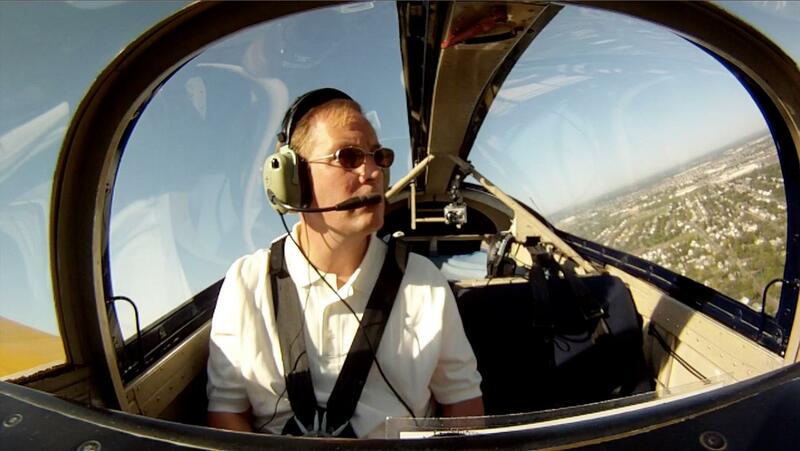 I gather that a lot of gliding is understanding the sight picture, being able to judge your sink rate, and having a good stick-and-rudder feel for the aircraft. 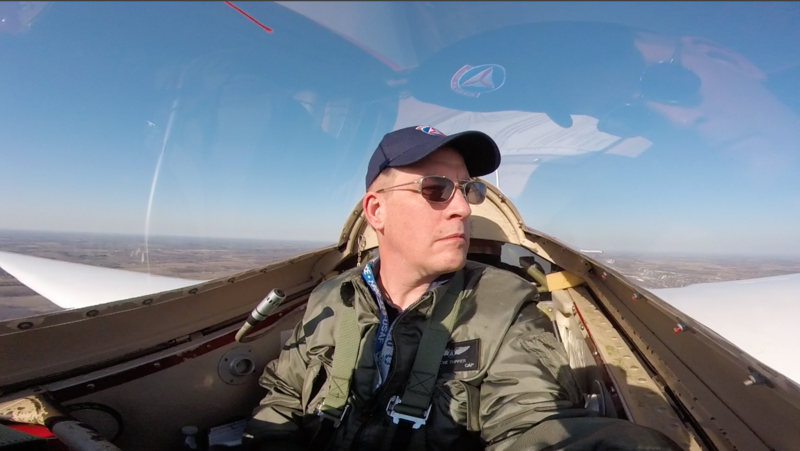 Once we shut down the engine, I felt pretty good about the glide. It was stable and the maneuvering was a lot of fun. But then I had that immediate power-pilot urge to turn directly for the airport and set up for a huge slip to get it down on the big runway. Gliding is hanging it out there and knowing what kind of ground the aircraft will cover given the winds, density altitude, and lots of other factors. I’m sure that that will come with experience. You just have to know the sight pictures and develop a new set of decision points to assure that you can make it to the airport and land gracefully when you get there. Motor gliders have some of the best of both worlds to offer. 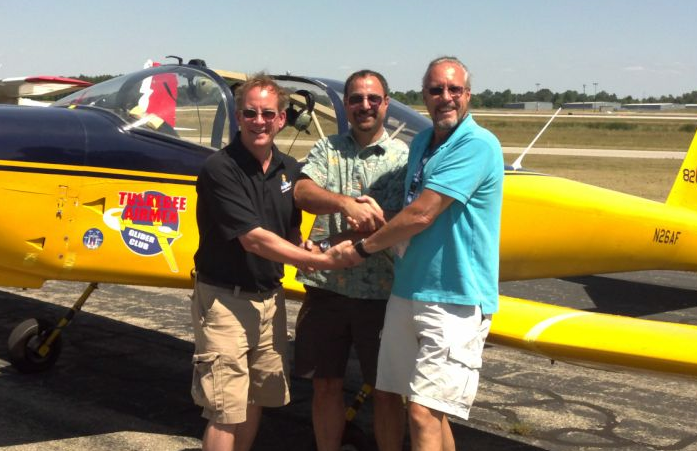 In any case, it was a great transition to flying something with no engine at all. Which, by the way, was the very adventure that I had (twice!) within the next few hours. Stay tuned to the feed for video and audio from the flight!